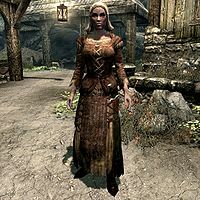 Katla is a Nord farmer who runs Katla's Farm southwest of Solitude. Although she is married to Snilling, she never lets him outside as he would "only hurt himself out here". Surprisingly, her husband concurs and hints at how she has outgrown him in terms of strength. They have a son, Knud, who wants to become a farmer when he grows up. Katla believes in honest pay for honest work, and will therefore pay you for harvesting leeks, potatoes, and wheat. She gets up at 6am and starts her workday at the farm. She stops working at 10pm and relaxes inside the house until 12am, when she goes to bed. Katla wears a set of farm clothes along with a hat and a pair of boots. She wields an iron dagger and carries her key to the farm. Living the busy life of a farmer, Katla will greet you quite briefly: "Can I help you?" She will then tell you about how her husband does the indoor work at the farm: "My husband handles the indoor work. Just as well - he'd only hurt himself out here." She will admit that her line of work is difficult, but she seems to take great pride in it: "It's hard work keeping Solitude fed, but I wouldn't trust any other family to do it." Katla: "Another gorgeous gray day, right dear?" Snilling: "It's too cold for my bones, but that never seems to stop you, dear." Knud: "I'm gonna go play soldier with a tree!" Katla: "That's nice, son. Just don't stomp on the crop like last time!" Snilling: "I'll see if I can't get some work done inside, where it's warm." This page was last modified on 24 August 2017, at 01:07.